There are places throughout the world where people choose to travel by motorized scooters. It is easier to manage the traffic, you don’t need a driving license, and the scooter is often cheaper to run than a car. If you are looking for the best 50cc scooter to get your around, you can easily find the most reliable options in our review below. We have done the research to bring you the 7 best 50cc scooters on the market to help you find the right one for your needs. With a four-stroke engine, this scooter will get you where you need to go. The scooter gets up to 110 MPG, and the fully automatic engine and transmission help it go faster, around 40 MPH. The lightweight body makes it easy to get up to higher speeds, and since it is street legal, you can ride this scooter around anywhere. The only downside is that this scooter is not CARB certified for riding in California, and it requires assembly. This scooter might look small, but it is actually able to support two adults. It comes with a trunk that matches the color of the scooter in dark blue. This scooter is one of the best 50cc scooter options out there as well, and the double seat makes it easy to bring friends along on those travels. The motorized scooter has both a disc front braking system and a rear drum braking system so you will never be caught without a way to stop. This is one of the lightest scooters out there, sitting at only 250 pounds total. This lightweight feature makes it easier to ship as well. With 10-inch rims, this bright green and black scooter is a great option for your traveling needs. It can hold up to 225 pounds (102 kg), and it is light itself. With a fork kickstand, this scooter will sit up easily in your garage or storage space, and the California approval just makes it even better for those out west. 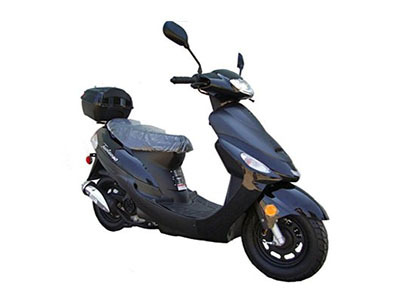 The scooter also features a lightweight body frame so you can easily get where you need to go without added weight or drag to hinder your gas mileage. This is a great scooter for those who need something light and easy to handle as well. 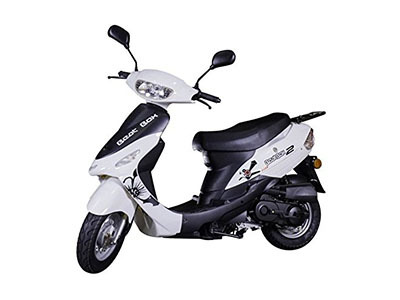 If you are looking for a classic scooter, this white and black option is a great way to get around. The scooter features 10-inch (25.4 cm) rims, and the rear suspension features a hydraulic spring that gives it a special boost for travel. The scooter can hold 225 pounds (102 kg) total, and this is ideal for adult drivers. The lightest scooter on the list, this 225 frame is easy to handle when on the streets. The motorized scooter is also easy to care for, though it doesn’t have a forked kickstand for storage capabilities. If you are looking for a great, classic scooter, this product is one of the best scooters on the market right now. Featuring the CARB approval for California, a matching trunk, and more, this scooter will get you where you need to go. The tires feature a 120/70 as well as a 2.15×12 inch (5.4×30.48 cm) rims for both front and back tire. You can even get a fast getaway with the automatic transmission. Going up to 35 MPH, you can enjoy a smooth and easy ride with this scooter. You can easily ride in style with this 50cc sporty scooter. 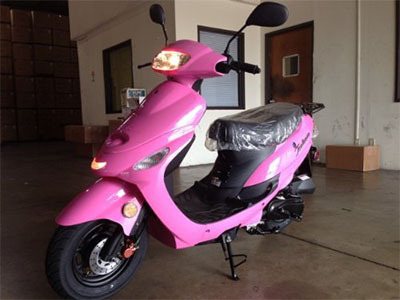 The bright pink color makes it the best 50cc scooter for girls and women that love showing off their girly style. The scooter is CARB approved for use in California, and the 10-inch rims make it easy for you to get around. This scooter has a weight limit of 225 pounds (102 kg). The scooter can hold two adults at once with plenty of leg room, and the alloy wheels are ideal for traveling the streets to get you where you need to go. This fully automatic Tao option makes the best 50cc scooter on the market right now for those who want to ride in style. The scooter seats two grown adults, and it comes with a matching trunk for storing your things away while riding. 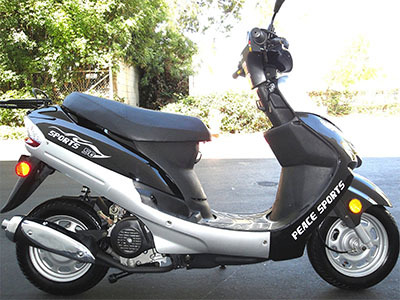 The scooter comes 90-percent assembled, and it is CARB approved for the state of California. The orange and black colors make this scooter stand out from the crowd as well. One of the best ways to get around on the streets and sidewalks of a big city is by a scooter. Though, finding the best 50cc scooter for your needs is not always easy. 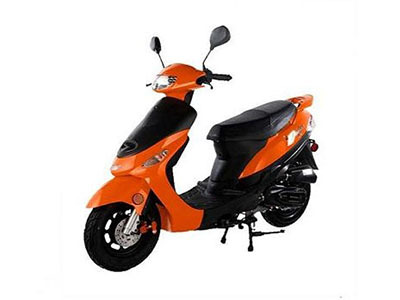 By looking at the products above, you can compare each product to find the best 50cc scooters out there to better select the one you need for your travels. Instead of walking everywhere you want to go, getting a motorized scooter can both help you get somewhere faster and give you more freedom to travel. Even if you don’t live in a major city, just getting around your town can be easier with a motorized scooter, and luckily, we have the options you need to choose the best 50cc scooter to get you right where you need to go, every time. The Tao Sporty Black Scooter is not as small as you may think. In fact, it is pretty spacious for what it is, and it can hold two people. It rides pretty well and if you are considering to buy this scooter, then this is the one I would suggest. Thank you for your input! 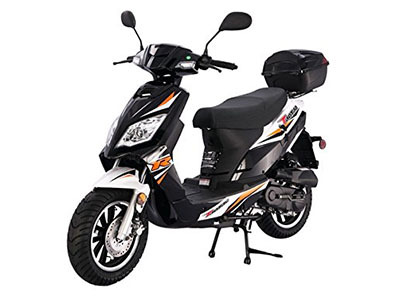 When researching for our article, we saw that many people love the space that comes with the Tao Sporty Black scooter. We must admit we also love this model, so we recommend it as well! The Chinies Scooter ATM-50 is quite sporty and works quite well. I have heard others say that this one is not cool enough but I don’t agree with that. And besides, what is more important, having a cool product or an effective and safe one? Hi there! We have to admit we agree with you, Jean Luc. We’ll always prefer safe and effective scooters over the cool ones. People need to remember that trends come and go, but the most important thing is to keep safe. Because I am very tall, I felt that the Chinies Scooter ATM-50 was my best bet and my gut feeling was correct. I have had an easy time using it. I would recommend this for anyone over 6 feet tall. Thank you for your recommendation, Paul! We’re happy to hear you found the perfect bike for your height, and we’re inviting you to check out some other options as well! 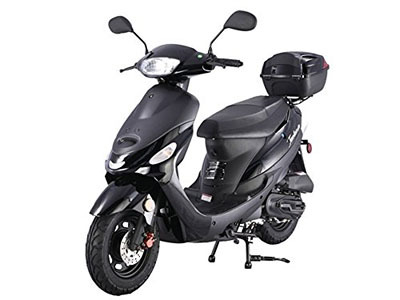 The one that appeals to me the most is the Tao Sporty Black Scooter and I am interested in hearing if others who have it liked it or not. If not then I want to know why as I don’t want to buy this without investigating thoroughly first. We’re happy you asked that, Davis! We stumbled upon plenty of positive reviews for the Tao Sporty Black Scooter while doing our research, but there are some downsides as well. For example, some users complained that some parts are cheaply made, so they may deteriorate in the future. At the same time, the rear trunk makes it difficult for the rider to access the fuel cap. Make sure you know all the details before buying, we wish you good luck! I am with Davis. The Tao Sporty Black Scooter looks quite cool and appealing. I have not heard anyone in my circle of friends talk about this one. But they have different scooters and I wanted to explore different options, and this one sounds the best. Thank you for your opinion, Evan! Indeed, we stumbled upon lots of positive reviews for the Tao Sporty Black Scooter, so we have no doubt it’s a great bike. Did you enjoy other models as well? Let us know! I really enjoy riding the Chinies Scooter ATM-50 because it really is easy to use and the ride is so smooth. It is a bit pricey but I won’t complain. If I get quality, then I will pay for quality. Hi, Tannon! Although we try to hunt the best sales and offers, we must agree with you that if you want the best quality, then you have to pay for it. We hope the Chinies Scooter won’t disappoint you!